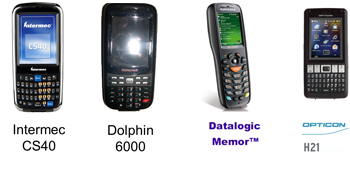 A request came to the UXD team asking for a competitive analysis between one of Intermec's smallest, rugged handheld computer, the CS40 and three competitor's devices: the Honeywell Dolphin 6000, the Datalogic Memor, and the Opticon H21. I was assigned this project. The competitive analysis consisted of documenting the unpacking of the device, setting the device up, and undertaking standard tasks using the device. The process was documented with digital photography and an audio recording of the think aloud process, and screen shots were taken of the tasks and interfaces. To keep a consistent methodology, a checklist based on the IBM Out Of Box Experience (OOBE) standard process document was used. 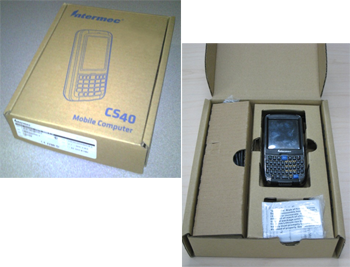 The Intermec CS40 was the first device analyzed. As this was my first time doing a competitive analysis, the manager of the UXD team walked me through the standard process with this device. I then completed the remaining analyses on my own. After I finished documenting the out of box experience for all of the devices, I transcribed the audio recordings and began the analysis of the results. My primary deliverable was a PowerPoint presentation comparing thirteen attributes (packaging, battery, wrist strap, power on, configuration and software, touchscreen, etc.) between each of the devices. This consisted of a summary chart of overall ranking, three tables with more detailed information concerning the evaluation, and a final chart comparing what we did well and what could be improved on the CS40. I presented my findings in a stakeholder meeting.